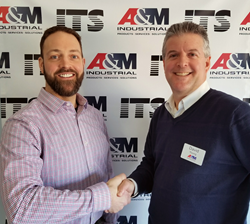 A&M Industrial Inc., acquires Industrial Tool Specialist (ITS), an industrial distributor headquartered in Springfield, VT.
(left to right) Steve Chadwick of ITS and David Young, President of A&M Industrial. David Young, President of A&M Industrial, stated, “ITS’ affiliation with A&M broadens its product line and enables ITS to offer its customers access to a host of leading global manufacturers of quality tooling and abrasives." A&M Industrial Inc., has acquired Industrial Tool Specialist (ITS), an industrial distributor headquartered in Springfield, VT. ITS has built their 45 year reputation in the metalworking industry as a leader in providing application support and technical assistance to manufacturing companies throughout New England. The team in Vermont will operate as ITS, a division of A&M Industrial, and will continue to service customers from their offices in Springfield VT.
A&M Industrial Inc., headquartered in Rahway, NJ, is a full line industrial supplier and operates a 160,000-square foot distribution center in Cranbury, NJ and sales offices throughout the Mid-Atlantic region. The company offers a diverse line of MRO products, with a team of product experts in categories such as Cutting Tools and Abrasives, Safety Products, Material Handling & Storage Equipment and Process Equipment. Additionally, A&M operates a variety of integrated supply and vendor managed inventory programs.